A few weeks ago I wrote a piece on widget marketing. One of the widgets that received an honorable mention was sphere.com. Sphere is a blog search engine that aids in the discovery of high-quality, relevant, and timely blog posts. The benefit to sphere is that publishers can integrate contextually relevant blog posts alongside their articles. Found something that you like? Then “Sphere It” with the Sphere It Widget which pops up a window to show you articles and other blog posts related to what you're reading. 2. Those who already use blog search engines, and are sick of disappointing results and spam. They desire a faster, more intuitive, and feature-rich experience. 3. Publishers who might like to include some really good blog content in their websites and articles. Those who seek relevance. · An easy-to-use, intuitive search engine. · Great search results, with posts ordered by relevance or time. · Related mainstream media, books, photos and podcasts right next to the results for a complete picture of the conversation. · Recommended blogs by topic. · Sphere's award winning Contextual Widget integrates results into several popular websites such as Time.com, Dow jones Market Watch, ZDNet, Techcrunch and GigaOM. It sounds pretty good doesn’t it? I’ve signed up for an account and will be testing Sphere over the next little while. It has a lot of potential and if it can return relevant results as they say they can, then users will be lining up to use this blog search engine. From what I’ve seen and read about Sphere, the relevancy factor is not an issue. Sphere has it covered. There’s been a lot of hype about Sphere. (You’re bound to hear a lot more in upcoming weeks.) The cool thing about Sphere is that it is not just for geeks. 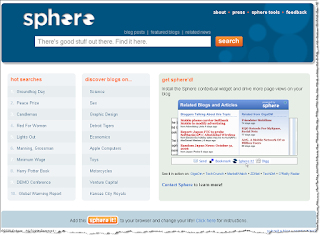 Users new to the world of blogging will definitely find Sphere useful. Sphere is based in San Francisco but have team members located in Seattle; Denver; Vancouver; New York; Phoenix as well as the Bay Area.